Texas Conservative Republican News: Re-Elect David Bellow to SREC - Moderates are Trying to Remove Conservati​ves from Republican Party! Re-Elect David Bellow to SREC - Moderates are Trying to Remove Conservati​ves from Republican Party! There is a push to kick out the most outspoken conservative Republicans on the SREC so that the party will attract more moderates to join the party who do not believe in our Republican values. I want more people to join the Party too, but not at the expense of our values. Compromising is what got America in this mess in the first place! We need to stand for what we believe! I fought against the Moderates in the Republican Party on the SREC. I boldly stood for Republican values if our State Platform when others on the SREC wanted to water them down. When I first got on to the SREC two years ago, I was a fresh face and was not part of any groups and did not play any political games. I just went in with a fresh mind and stood for what was right. I immediately saw needed changes and made them and stood where I saw moderates trying to take over. In my first year I proposed and passed a resolution calling for the proposed platform to be posted up online the night before the vote on the platform (I was tired of people not having time to read the proposed platform changes because they get the proposed platform on the day of the platform vote). I amended the Bylaws to create an official Chaplain for the RPT when some did not want to have a Chaplain anymore There was also a question of whether or not to have a chaplain for the Republican party of Texas, I thought it would be crazy not to have one. It was revealed that the party did not officially have a chaplain position in the bylaws. Well I thought the answer to that was easy. Change the bylaws! I fought to follow the 2010 Platform Legislative Priorities Report that required the RPT to publish a list of voting records of our leaders compared to our Party Values so we know how people really vote. The 2010 State Republican Convention Delegates passed in the platform a section that asks the SREC to put out a legislative priorities report so that republicans can see how their leaders voted compared to the Party Platform values. I fought hard for the republicans of Texas who voted to put out this report, but the report did not pass due to the moderates voting it down because they do not want people to see that some Republicans do not really have Republican values. I Kept Texas Republicans informed about IMPORTANT Texas Republican News and Issues via my Blog and Emails, more than any SREC member in the past has ever done. From redistricting/election date news to important issues that the Republican Party of Texas (SREC) was debating, I ALWAYS kept everyone informed. I posted hundreds of articles on my blog and sent out probably over 100 emails in the last 2 years with important updates. I strive to make sure everyone knows what is going on behind the scenes of the RPT. It is YOUR party and you should know what is going on! I was ALWAYS Available to Help ANY County Chairman or Republican in or out of my District. When Jasper County’s chairman died and Cherokee County was having problems and their Chairman resigned, I was called by them about the problem and I immediately stepped in to help them through the process of getting back up and going with a new chairman. These are just two examples of how I have always been readily available and eager to help my district. I am not your chairman and I do not run your county party, but I am always here if you need any help or have any questions about the State Party. Just pick up the phone and call! I Fought for our East Texas Conservatives that Moderate Joe Straus tried to kick out in Redistricting. Joe Straus was elected to speaker by the Democrats. Last year he did not stand in the way of the Republican Majority in the House of Representatives so we were able to get some Conservative Legislation passed, but he is not conservative himself and he has waged a war against the strong conservatives in East Texas who voted against Straus for Speaker of the House. He gutted Wayne Christian’s District so that Wayne lost and he tried to do the same with David Simpson and James White. 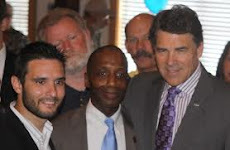 I fought for James White against Straus and helped Super Conservative James White stay in office. I know that some fellow Republicans to not like me because I am not a fan of Joe Straus, but I stand first for our Republican Platform Values before I stand for people. Without our values we are just a big social group with nothing to stand on. I Am Asking to be Re-Elected for Only one more 2 year term and then I Will Ask Someone Else to Run I am asking for 2 more years on the SREC so I can energetically fight Obama in this upcoming election and stand for conservative values on many important issues coming up this year (like redistricting in which many of our east Texas Conservative Republicans were hurt in redistricting by the more moderate Republicans in Texas) During this next two years, I would like to invite ANYONE who is interested in running for SREC to come to the meetings with me so you can start to understand the SREC and will know what you are getting into when you run in 2 years. I will not run again in 2 years because my wife and I have our first baby coming at the end of this year and in two years I will want to take a break from politics to focus more on my family and being home to raise a young child with good values. Family and God come first! In less than 2 years that I have been on the SREC, I visited all 16 Counties in SD3 at least once and sometimes twice or three times (except one county that unfortunately did not have regular meetings to go to so I just visited with republicans in that county on my own). This was a hard task because the district is hundreds of miles across and many counties have meetings on the same day of the month. I ran for SREC at the last convention and vowed to visit every County in Senate District 3. Some of the rural east Texas Counties had not been visited by a Committeeman in years and many of them did not even know what the SREC was. I knew I might make some of the bigger Republican Counties mad by not focusing on going to their meetings every month (I know some in Polk and Montgomery have asked why I have not gone to more of their meetings in the last couple of years). The way I saw it is that there were 16 counties (now 19) in SD 3 and I wanted to visit all of them, not just a select few that have the most votes to get re-elected. Many on the SREC thought I did too much. I even had some SREC member come to me in my first SREC year and they told me I was doing too much and that I needed to just sit back and watch everyone my first two years to see how they run things. I told these SREC members that I was only elected for two years and my voters elected me to come to Austin to stand for conservative East Texas values and not just sit and watch. I didn’t just sit and watch. Unfortunately I knew that the establishment and/or moderates would not like that I stood so strongly for Conservative values and did not play the political game. I knew I would have people run against me for SREC. Some probably want me gone because they don’t like that I do not just follow along with everyone else, and some of the more moderate Republicans want me gone because I was too conservative. As a result, I believe I will have at least two challengers running against me to take my place on the SREC. So Please Vote to Keep Me on the SREC as a Strong Conservative Fighting for You! I first got elected to the SREC only 2 years ago when Jim Wiggins was term limited out. The RPT has 8 year term limits because the Republicans in Texas understand the importance of not allowing someone to be in power too long so that fresh faces can come in and see potential problems that have been overlooked and give new life and energy to the Party. Even nice people in power for too long will get set in their ways and become part of a system. Jim completed his 8 year term and could not run again because he was term limited out. That is when I ran and got elected to the SREC. I hear that Jim Wiggins is one of the gentlemen asked to run against me. He is a nice guy, but he did his term limit and we don’t need someone who will just fit in and go with the crowd. We need someone with energy who will stand strong for conservative values and fight off the push to make out Party more moderate. Jim didn’t even have anything to do with the district after he got off of the SREC. He even just sent an email to former Jasper Chairman Gene Acree because he did not even know that Gene passed away last year and Jasper has a new chairman now. I fear his interest is only to defeat me because I am too conservative and do not go along with the crowd. Please vote for me so I can continue to fight hard for conservative values for one more two year term.